Wuhan is the capital of Hubei province, China, and is the most populous city in Central China. It lies in the eastern Jianghan Plain at the intersection of the middle reaches of the Yangtze and Han rivers. Arising out of the conglomeration of three cities, Wuchang, Hankou, and Hanyang, Wuhan is known as “Jiusheng Tongqu (the nine provinces’ leading thoroughfare)”; it is a major transportation hub, with dozens of railways, roads and expressways passing through the city and connecting to other major cities. Because of its key role in domestic transportation, Wuhan was sometimes referred to as the “Chicago of China” by foreign sources. Wuhan natives speak a variety of Southwestern Mandarin Chinese, Wuhan dialect (Chinese: 武汉方言), and it differs slightly between regions, such as Wuchang dialect, Hankou dialect, Hanyang dialect, Qingshan dialect. Wuhan is in east-central Hubei, at latitude 29° 58’–31° 22′ N and longitude 113° 41’–115° 05′ E, east of the Jianghan Plain, and is at the confluence of the Hanshui and Yangtze Rivers along the middle reaches of the latter. 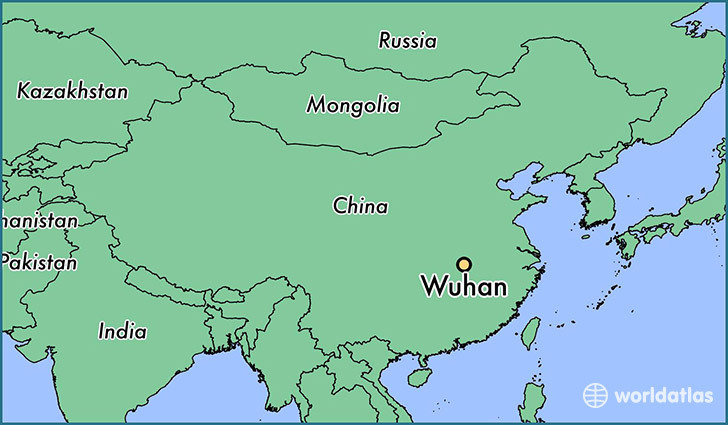 The metropolitan area comprises three parts—Wuchang, Hankou, and Hanyang—commonly called the “Three Towns of Wuhan” (hence the name “Wuhan”, combining “Wu” from the first city and “Han” from the other two). The consolidation of these cities occurred in 1927 and Wuhan was thereby established. The parts face each other across the rivers and are linked by bridges, including one of the first modern bridges in China, known as the “First Bridge”. It is simple in terrain—low and flat in the middle and hilly in the south, with the Yangtze and Han rivers winding through the city. Wuhan occupies a land area of 8,494.41 square kilometres (3,279.71 sq mi), most of which is plain and decorated with hills and a great number of lakes and pools. Wuhan’s climate is humid subtropical (Köppen Cfa) with abundant rainfall and four distinctive seasons. Wuhan is known for its oppressively humid summers, when dewpoints can often reach 26 °C (79 °F) or more. Because of its hot summer weather, Wuhan is commonly known as one of the Four Furnaces of China, along with Nanjing，Nanchang and Chongqing. Spring and autumn are generally mild, while winter is cool with occasional snow. The monthly 24-hour average temperature ranges from 4.0 °C (39.2 °F) in January to 29.1 °C (84.4 °F) in July. Annual precipitation totals 1,315 millimetres (51.8 in), mainly from May to July; the annual mean temperature is 17.13 °C (62.8 °F), the frost-free period lasts 211 to 272 days. With monthly possible sunshine percentage ranging from 31 percent in March to 59 percent in August, the city proper receives 1,865 hours of bright sunshine annually. Extremes since 1951 have ranged from −18.1 °C (−1 °F) on 31 January 1977 to 39.6 °C (103 °F) on 1 August 2003 (unofficial record of 41.3 °C (106 °F) was set on 10 August 1934). Wuhan is one of the birthplaces of the brilliant ancient Chu Culture in China. Han opera, which is the local opera of Wuhan area, was one of China’s oldest and most popular operas. During the late Qing dynasty, Han opera, blended with Hui opera, gave birth to Peking opera, the most popular opera in modern China. Therefore, Han opera is called “mother of Peking opera” in China. “No need to be particular about the recipes, all food have their own uses. Rice wine and tangyuan are excellent midnight snacks, while fat bream and flowering Chinese cabbages are great delicacies.” Hankou Zhuzhici (an ancient book recording stories about Wuhan) produced during the Daoguang Period of the Qing dynasty, reflects indirectly the eating habits and a wide variety of distinctive snacks with a long history in Wuhan, such as Qingshuizong (a pyramid-shaped dumpling made of glutinous rice wrapped in bamboo or reed leaves) in the Period of the Warring States, Chunbinbian in Northern & Southern dynasties, mung bean jelly in the Sui dynasty, youguo (a deep-fried twisted dough stick) in the Song and Yuan dynasties, rice wine and mianwo in the Ming and Qing dynasties as well as three-delicacy stuffed skin of bean milk, tangbao (steamed dumpling filled with minced meat and gravy) and hot braised noodles in modern times.